I don’t talk as much about hair care on this blog as I do about skin care or tea, but I do touch on it occasionally. The fact is that I’ve been obsessing about my hair care routine for much longer than I’ve really cared about my skin care. I actually found out about Korean skin care from a hair care forum to which I used to contribute. So I thought I’d talk a little bit about my hair care philosophy again, and give a little update about how I’ve been caring for my hair. 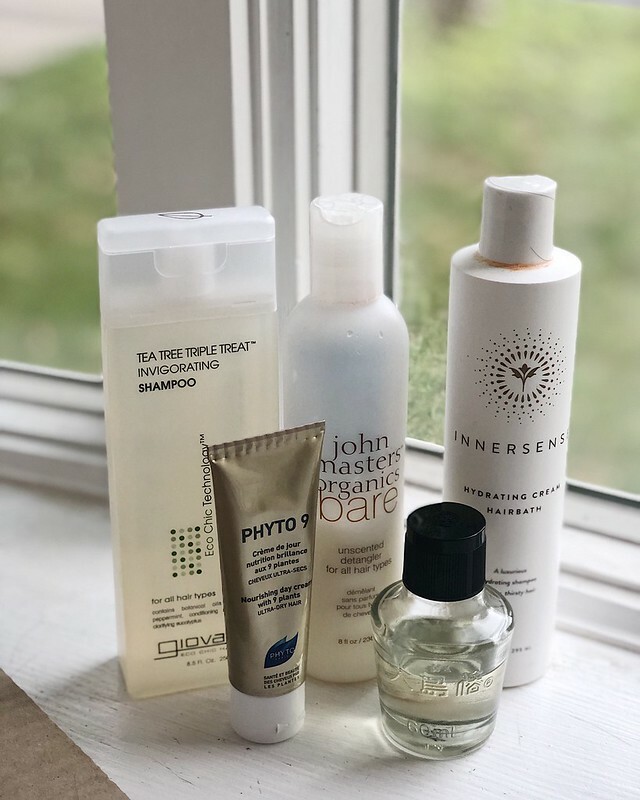 While I’ve had hair as short as a pixie and as long as mid-back, with every length in between, my hair care routine is always based on the care philosophy of people who are caring for ultra-long hair. Long hair is old hair, so the standard advice in the long hair community is to treat your hair like it is an antique lace table cloth. So, you want to handle your hair gently, keep it protected, wash it gently, and don’t wash it more than you have to. Translated to hair care, that means that, in the long hair care world, people try to stretch out washing as long as possible, and use very gentle tools and styling. Which is what leads me to my title about the paradox of long hair care. You see, a lot of people consider long hair to be a lot of maintenance. I mean, you have a lot of hair, it’s going to take a lot of time to wash and dry. You’re going to need more product to coat it. And you need to spend time to style it. But at the same time, I actually spend a pretty small amount of time on my hair on a daily basis. My current hair care routine is to wash it three times a week. On Sundays, I wash it with a more cleansing shampoo (Giovanni Tea Tree Triple Treat) and do a deep conditioning treatment by leaving an unscented condition on my hair for 5-10 minutes while I shave my legs. On Tuesday and Friday mornings, I only wash my hair, using a moisturizing shampoo (Innersense Hydrating Cream Hairbath), and then towel-dry it and apply a mixture of hair cream (Phyto 9) and hair oil (Oshima Tsubaki Oil). Other than that, I will occasionally rinse my hair if I get particularly sweaty or dirty, but mostly I just braid or put it up in a bun. Yes, it would take a long time to blow-dry my hair, but I don’t blow dry my hair very often. Most of the time, I let my hair air-dry as much as possible, and then style it gently. The biggest hardship is that sometimes my cat decides that my loose, drying hair is the best toy in the world. Since getting pregnant, I’ve actually put some thought into whether or not I should cut my hair. But I’ve realized that short hair can have just as much upkeep as longer hair, and since I mostly keep my long hair up in a bun, I don’t think there’s much risk of getting it caught in things. As far as styling goes, I generally stick to two basic styles these days. Either I braid it and fasten it with a metal-free band, or I put it into a bun and secure it with a hair pin or clip. Both of these styles are relatively quick and can be done with damp hair, as long as I’m careful not to pull damp hair too tight, since it is more delicate than dry hair. So on a normal day, I’ll spend maybe 5 minutes washing my hair, let it dry while I take care of the rest of my morning routine, and then less than 5 minutes to put it into a bun or braid. But at the same time, I’ve spent a lot of time over the years thinking about my hair care routine. I have a similar sense of what my hair likes and dislikes as I do with my skin. So it has taken a lot of effort, if not a lot of day-to-day time. But since I generally prefer my overall “look” with longer hair, and don’t really like to wear my hair loose, I find the effort worth it. For those of you who read my review of Deciem’s Hair is Fabric line last week, check back to see an update. The short version is that I’m probably not going to keep using them. But I thought I’d share a bit of what I have been using for a while and does work well for my hair. So, to briefly recap my hair background: I have very long, thick, straight hair. My scalp hates conditioner, but my length needs nourishment and moisture. So I’m pretty well stuck with a 2-step process of wash+condition. But then, that’s what many of us do anyway, so it’s not terribly tedious. I have learned some tricks from my years on long hair care forums, as well as by trial and error (so much error). First of all, I’ve said my scalp hates conditioner. It also hates sulfates (my entire body does), castor oil, and anything with a high pH. I used to try to wash my hair with soap. That did not go well. My length loves deeply moisturizing oils and doesn’t need much in the way of silicones to keep it tangle-free. But my skin doesn’t get along with coconut oil, shea butter, or olive oil, so I try to avoid these in my conditioners in order to prevent body breakouts. I tend to wear my hair up or back every day. I try to alternate between a bun and a braid so that I don’t end up with tension spots, but also because sometimes putting my hair up in a bun is enough to start a headache, which will invariably turn into a migraine for me. My hair is about down to my mid-back and bothers me when I wear it down. It also likes to get caught in things and occasionally attacks passers-by. So on to the products. For the past few months, I have been using and loving the Skylake Herbal Cool Shampoo and the Skylake Silk Cocoon Conditioner, both from a Korean brand, and both available at Mishibox, which is practically in my backyard, so shipping is quick. I’m not thrilled by the scent of the conditioner, as the jasmine is augmented with much ylang ylang, which isn’t my favorite. But for now, it leaves my hair gorgeous and doesn’t irritate my scalp. I wash by first washing my scalp with shampoo, rinsing, and then putting conditioner just on the length of my hair (about from the ears down). Then, I put my hair up with an acrylic hair fork and do the rest of my shower. Maybe on the weekend, I’ll give it extra time while I shave my legs. Then, rinse, give it a quick blot with a towel, and twist up in my Aquis Lisse turban towel. I’ve started washing my hair at night, usually either right before or right after dinner, so I can leave my hair up while I do skin care, and then let my hair loose to dry for an hour or so before bed. Then, I either put it up in a loose scrunchie bun or a braid before bed. I do sometimes oil my hair, though lately I’ve been lazy about that. I love my NightBlooming custom oil blend (which became the Frostfall Flowers monthly oil blend). It’s a blend of nourishing base oils, plus fragrant floral oils, and a little vetiver and frankincense to keep things interesting. But more often than not, I just use a bit of Japanese camellia oil. Three drops of oil worked through the ends is all I need. And on barre class days, I’ll use a little Klorane dry shampoo to soak up sweat before going to work. And that’s it. Lately, I’ve been getting the itch to cut my hair shorter, and I’ve also been considering going fragrance-free in my hair products, as I’ve developed a bit of a patch of eczema on one ear. So far, the Skylake products don’t seem to irritate it, but I don’t rightly remember when it popped up, so who knows? But that’s my basic hair care routine. NB: I have not been offered any freebies or incentives to discuss any of the products mentioned, nor are any of the links affiliate. Of all my beauty practices, my hair is the most complex. It has involved more experimentation than even my skincare routine, and has gone through far more ups and downs. That’s to say, in addition to the quality of my hair, I’ve also run the gamut of length. The Victorian women to whom I often turn for beauty inspiration wore their hair long and pinned up. For years, I grew my hair long, letting it get to my waist at one point, and I wore it up almost all the time. I still have an edited version of my vast collection of sticks and combs and hair toys from my very-long-haired days. After my divorce, I got a pixie cut. I actually liked it a lot, and stayed pretty short for the next few years. But I haven’t had my hair pixie-cut for over a year now, and my hair has grown back out to a chin-length bob. So I can experiment with more hair styling, although the elaborate buns are out of the question. I occasionally set my hair in rollers, but the result is decidedly 20s due to the length. I look rather like Betty Boop. As far as hair products go, this is where I feel the need to compromise quality with natural-ness. I’ve tried all sorts of totally natural and homemade hair washing techniques, including herbs, egg shampoos, soap-and-vinegar washes, and “no-‘poo,” and all left my hair pretty gross. 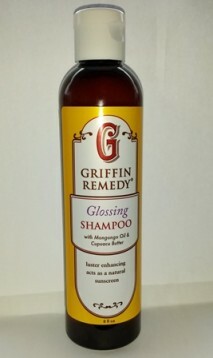 I had resigned myself to using detergent shampoos, albeit the gentlest and most natural I could find, before I found my current shampoo and conditioner: Griffin Remedy. I cannot tell you how impressed I am with this line. I first found their hand lotion because I needed a pump bottle to keep on my desk and they were one of the few without a common ingredient that irritates my skin. I also loved the vintage look of their logo, and when I looked at their website and saw they had shampoo, I was intrigued. But I was wary. Looking at the ingredients list, there was nothing on it that would suggest the product would be at all effective. It just seemed too damned natural. But I looked around, and it had a lot of surprisingly good reviews. So I bit the bullet and ordered a bottle of their Daily shampoo and conditioner from the website. I have to say, my first week using Griffin Remedy was amazing. I had to use so much less of the shampoo than my normal natural shampoo, that I actually used too much the first time and had a hard time rinsing it all out. And does it ever lather! It was like an episode of I Love Lucy on my head when I went to lather it up the first time. After that first mishap, I learned to use a quarter-sized amount and lather it up. It leaves my hair clean and very, very silky, especially the next day. I also got the accompanying conditioner. It’s rich enough for my coarse, indestructible hair, and they both smell like oranges. Of course, over the holidays, I had another mishap: I left my shampoo at Boyfriend’s family’s house. And since I had discovered a product I loved, I had to order more. This time, I ordered the Glossing shampoo and conditioner (they were on sale!) and I love them, too. They have a slightly different scent, but it’s still light and natural, and the conditioner is maybe a bit richer. I’ve taken to only washing my hair about every other day. I try to stick to three days per week, but if my scalp feels funky, I go ahead and wash it. My hair is much more unhappy with under-washing than over-washing. On in-between days, I sometimes rinse my hair with plain water to refresh it, or I’ll just don my turban to keep my hair dry while I shower. When I wash my hair, I wet it down and then lather up with my head flipped upside-down. It’s really the only way I can access my entire scalp properly to clean it. I smooth on the conditioner upside-down, too, in order to make sure I get the whole length, but avoid the scalp. Too much conditioner on my scalp has caused itching for me. I rinse well and then rinse with cold water at the end of my shower. Then I blot up moisture and twist my hair into a handtowel, securing it behind one ear. This keeps my hair up and out of the way, and takes out more moisture. My hair is naturally quite straight and heavy, and it is difficult to get it to curl, so I don’t generally bother. Plus, I like to shower in the morning to feel fresher, so I don’t have time to let my hair dry in rollers after a shower. Most mornings, I either blow-dry my hair with a round brush and pull the crown back into a large barrette, or else I’ll pin the top back and pull it into a ponytail. I also use side combs sometimes to pull it back into a more Victorian-style hairdo. A note about color: I used to color my hair with henna and indigo to cover the grey, but the process is time-consuming and messy. I’ve decided to embrace my grey hairs, which do stick out rather starkly from my dark hair, although I occasionally will use a temporary tint to cover them for the stage. When I do want to curl my hair, I use a spray bottle with a mix of rosewater and tap water to mist individual dry or mostly-dry sections, and roll it with foam rollers. I also dab on a bit of mousse. I roll it and let it set for a while, until it is totally dry. I might set the hair dryer on it for a bit. Then, I remove the rollers. This yields the aforementioned Betty Boop hairdo. Finally, sometimes I subject my hair to excessive amounts of abuse, for me. When I was in performances for my latest show, I had to do a 60s-inspired hairstyle. This involved blow-drying my hair to make it perfectly straight and fluffy, then flipping the ends out with a curling iron, pulling back the crown and securing it, and then spraying the front to look like side-swept bangs. I then secured the whole thing with hairspray. Needless to say, after two weeks of this, my ends were pretty crispy. So in order to treat my hair, I slathered on a few teaspoons of virgin coconut oil and left that in overnight before shampooing and conditioning the next day. It more or less revived my abused hair. So that’s my hair routine. I’ve now covered most of my basic beauty routine. there are, of course, constant updates and tweaks, so in the future I can focus on those.